One of the hot releases at Gen Con 2014 has been Golem Arcana the successful Kickstarter game project by Harebrained Schemes. Golem Arcana is a point-based army building game that blends the physical fun of tabletop gaming with the power of digital technology. It “seamlessly” connects a smartphone or tablet to the game’s figures, board, and cards via a Bluetooth-powered stylus designed specifically for tabletop gaming. Simply tap any of the game pieces with the stylus to send information to the app, or tap the board to make a move. That “seamlessly connects” and blending technology with physical miniatures is both the best, and worst part of the game. On the floor of the show, with nice tablets, and big screens, I received a seamless demo of how the game worked. Using a stylus, you’re able to control figures, with no need of a rulebook to memorize, dice to role, and an endless possibility to the game play. Myself, and those with me, were so excited about the game, and the demo was so good, we (myself and some other friends) decided to buy the game, $120 worth of it. Back to the hotel that evening to play, we opened the game, attempting to sync it with our iPad. It turns out, though we were told that the app worked on a generation 2 iPad or higher, in fact we needed a third generation and higher. Luckily we also had an iPhone 4S handy, one of the devices listed on the apps page. If your game relies on a device, you probably should know the device it can work on, we lucked out (I have a first generation iPad myself so no game for me I guess until the PC app is released down the road). The internet was slow, but we downloaded it to play the next day. After our second day, we excitedly got back to our room to play. Every few minutes, the iPhone crashed. With each reload, a new synch of the stylus was needed. We’d click some screens, and a crash again. After many attempts of this, we gave up, frustrated. Add this on top of the small screen, and you can see how our excitement was dimmed quickly. We couldn’t get past the first turn of the first player in the tutorial. 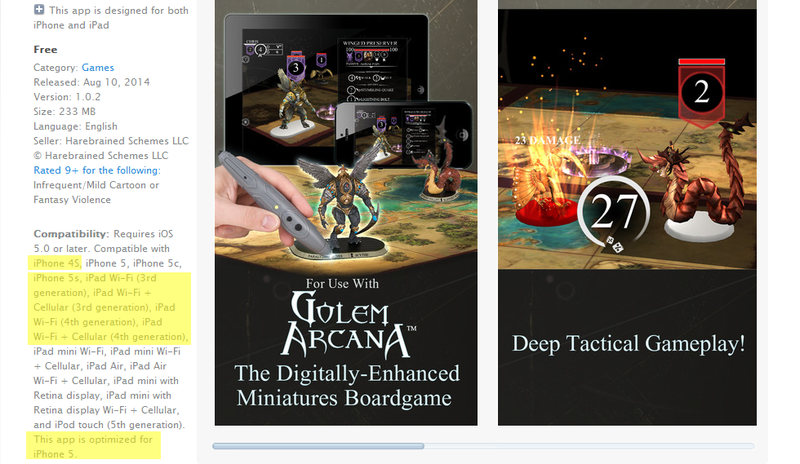 Go to the Golem Arcana app page and at the end of the list of devices that it should work on is “This app is optimized for iPhone 5.” So, here’s the issue…. on top of the $120 spent on the game (main game, plus two figure packs), we’re left in a quandary. To actually play, what is an amazing game, we’d need to invest another few hundred to get the right device to be able to do so. The irony in the end is, by using technology to free us the gamers from massive physical rulebooks, that same technology has also made it impossible to actually enjoy the game. And we did. They said updates were coming that might fix the issue. But, it also sounded like there was debate to include the 4S in the device listing. Our solution, GW has trained us to throw money to fix our problems so an iPad upgrade it is! Hey, I’m one of the Emissaries (Volunteers for HBS Organized play program) who was running several of the demo booths at GenCon. It’s definitely unfortunate you had such a discouraging experience immediately after your purchase. And it’s great you solved it with a new device. That said I’m also happy to hear you reported the bugs so the HBS team can fix the issue, and improve the experience to others. In the future if others are having issues, please reach out to HBS, or to the community at large. We’ll do everything we can to support. The “official” supported device list is limited (For good reason) but there are plenty of options that don’t require massive investments to get rolling. I’m Glasswalker (The site admin). Feel free to ask me any questions and I’ll be happy to answer them. For device support, the main limiting factor is the technical necessity to choose Bluetooth 4.0LE. Which is relatively new tech. As a result only newer gen devices and OS have support. That said the team at HBS is working hard to remove barriers to entry, and the community is doing the same. Soon support for Windows and Mac will be on the way, allowing a much more broad level of supported devices. In addition those of us in the community have been experimenting with support on a broad range of devices to hopefully help ease the entry for several users from a technology perspective. Good luck in exploring the new game, and I certainly hope you enjoy it!